The perfect addition to any tree, whether it's in your own home or the home of a loved one. This personalised tree themed bauble is personalised by you and so makes a thoughtful gift. Whether this is a pre-Christmas gift or something to open on Christmas day, your message on this bespoke bauble will show them how loved they are during the festive season. 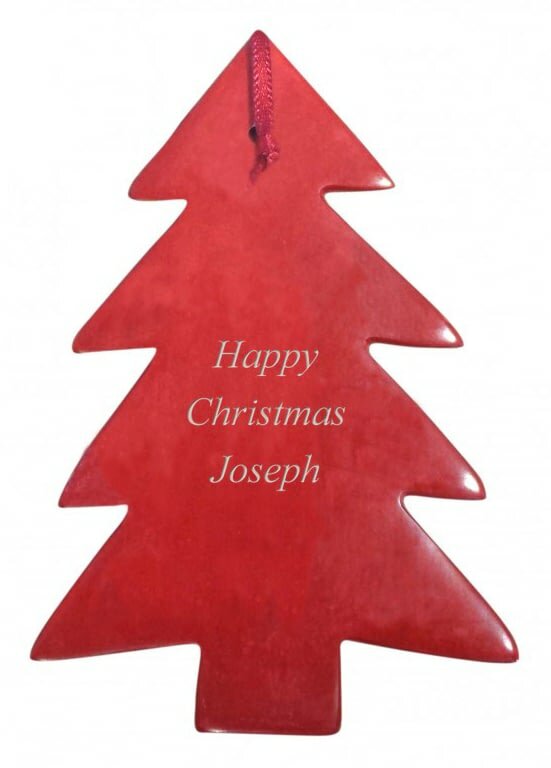 A red soapstone bauble finished with a festive red ribbon, ready to hang on the tree. Perfect for a little one, or someone who's young at heart. This jolly Santa bauble can be personalised with a message on the reverse over 4 lines. Add a personal touch to the tree this year with this lovely bone china bauble. Personalise with a name of up to 15 characters. This jolly Santa bauble is personalised with a message from you. This jolly Snowman bauble is personalised with a message from you.